We all know how amazing the taste of sweet and spicy can be together and I wanted to share this newest celebration of opposites attracting. I call this simple dish Cockatrice Sandwiches! It's made from scratch and takes about fifteen minutes from starting the dough in your hands to licking your lips. It only uses one bowl to make the dough and one skillet to cook everything else. It's a fast way to feed a crowd, too. Just double or triple the stuff. The name itself makes me smile, a mythical beast that is part rooster and part dragon (some of us have known some wannabe cockatrices that ended up in pot pies). The proud rooster on the Sriracha bottle in his red glory reminds me of the monster. Sriracha is a garlic hot sauce that really pops a kick without being overpowering the way Tabasco can be. I adore that stuff, and I found a wonderful new home for it. Oh, the other reason I call them Cockatrice Sandwiches is because there are three simple ingredients in the yummy beast. (Get it!? cockaTRICE! I'll be here all week!) 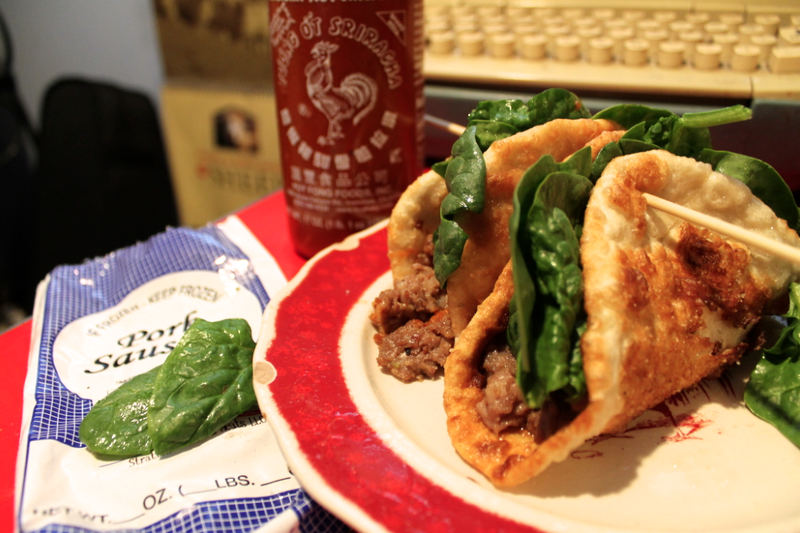 Sweet Sausage, Spinach, and Sriracha. It is served in a lightly sugar-coated piece of fried nan. Here's the story of the food you see pictured: Yesterday while down visiting friends and getting some hay at Common Sense Farm I was told I could go down to the greenhouse if I wanted to see something beautiful. When I walked inside I nearly gasped. Outside the world was wind and snow but in this poly tunnel was rows and rows of greens sprouting from the EARTH! Not started seeds on tables but actual spinach, lettuce, rocket, and kale in beautiful baby form coming out of the ground. It was the most green I saw in one place in a while. I literally danced down the rows, taking leaves and eating them like pieces of dark chocolate, unable to stop smiling. I went home with an amazing gift, too. A bag of baby spinach grown right here in Veryork. So I had fresh spinach. I also had one pound of sweet pork sausage in the freezer. (Here's something folks who aren't around farms or hunters might not know.) Sausage from the butcher rarely comes in links. It comes in pound sacks and it is your job to fill links if you want them as such. Local grocers just a cart ride away from my farm have sausage casings and spices for folks making their own links out of game or livestock. Anyway, I knew that the sausage would be good with the greens and I knew that the spicy garlic would connect with that sweet meat like dance partners on a Saturday night. But I didn't have any bread made and I sure wasn't about to waste gas and money driving to the store. So I made some quick flat bread, the recipe I use to make nan. I got out one big skillet and set it on the stove and set some olive oil beside it. I got out the sugar bowl and set it next to that. Then I poured some hot water (about 1/2 a cup) into a small mixing bowl with some active dry yeast and a tablespoon of honey and whisked it together. In about five minutes the yeast had activated and looked like a happy beer-foam island in a bowl of murky water. Perfect. I added flour a little at a time and a pinch of salt. I kneaded it into a ball of dough around the size of my closed fist and then put some flour on the table. I broke the dough into four pieces and using a rolling pin flattened them into pancake sized circles. I turned the range on high heat, put some oil in the pan, and let it heat to bubbling and then quickly fried the four pieces. They only need a minute on each side, sometimes less. The bread bubbles and then browns. Before they had dried from the oil pan I sprinkled a little sugar on them. This is an important step! When the bread was done I took the defrosted sausage and set it right into the same oil and pan I just used to make the nan. While the nan cooled and caramelized some of that sugar I spent a few moments with a wooden spatula getting the sausage browned and crackling. When cooked, magic happened. Here are the four steps to Cockatrice in the Kitchen. 1. Take nan and place sweet sausage meat inside. 4. Fold and devour and smile. You are a jewel! I've been meaning to make naan for the first time for weeks. You have a unique talent for making wild things like making your own bread, or making your own butter, doable, and easy. Love how you presented making your own bread in your first book, easy as can be! Thanks for sharing your take on naan. Really appreciate you! Thanks for the inspiration-must try this soon. We love Sriracha sauce too! That sounds delicious! I love it when a simple and quick meal turns out wonderful and satisfying. So I'm wondering...is a greenhouse next on your list? That looks delicious! I will try this recipe. I've made my own tortillas before, equally as easy but no yeast so not as fluffy and chewy as those babies look. Thanks for sharing! omg...this sounds freakin' delicious!! Bought some kale from Malta Ridge Farm yesterday. Still have some of your sausage in the freezer. I'm thinking this will be dinner tomorrow night. Thanks sweetie! I am waiting for your cookbook! ?